Get devious with DC Comics’ The Joker™ & Harley Quinn™! Place the mischievous DC Comics villains The Joker™ & Harley Quinn™ on the LEGO® Toy Pad to launch them into the LEGO DIMENSIONS™ multiverse. Use their weapons and activate their powerful special abilities to battle enemies and solve exciting puzzles. When things get tough, send in The Joker’s Chopper and Harley’s Quinn-mobile. Rebuild the Joker’s Chopper into a Mischievous Missile Blaster and The Joker’s Lock ‘n Laser Jet. Rebuild the Quinn-mobile into a Quinn Ultra Racer and Missile Launcher. Activate The Joker’s special Grappler, Target, Hazard and Electricity abilities, and Harley Quinn’s Acrobat and Super Strength abilities to solve puzzles and battle enemies. The DC Comics™ Team Pack (71229) Lego set is no longer directly available from the sites below. However, 3rd party partners of these sites might still have the set available. 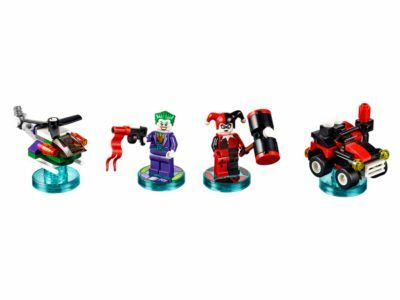 Alternate description Level up with the LEGO® DIMENSIONS™ DC Comics™ Team Pack, with buildable The Joker™ & Harley Quinn™ minifigures, plus 3-in-1 The Joker’s Chopper and Quinn-mobile models. Includes buildable The Joker™ & Harley Quinn™ minifigures, each with a weapon. Also includes rebuildable 3-in-1 The Joker’s Chopper and Quinn-mobile models. Rebuild the Joker’s Chopper into a Mischievous Missile Blaster and The Joker’s Lock ‘n Laser Jet. Rebuild the Quinn-mobile into a Quinn Ultra Racer and Missile Launcher. Place each character and model on the LEGO® Toy Pad and join the action in the game. Activate The Joker’s special Grappler, Target, Hazard and Electricity abilities, and Harley Quinn’s Acrobat and Super Strength abilities to solve puzzles and battle enemies. Visit LEGO.com/DIMENSIONS for more information on this exciting LEGO® building and video-gaming experience. Ask your parents’ permission before going online. The Joker’s Chopper measures over 1” (5cm) high, 1” (5cm) long and 1” (4cm) wide (alternative 3-in-1 vehicle builds vary in size). Harley Quinn’s Quinn-Mobile measures over 1” (4cm) high, 2” (7cm) long and 1” (3cm) wide (alternative 3-in-1 vehicle builds vary in size).